In a previous post, I've shared my analysis of the feedback from participants at the Regional Agro-industries Forum for Asia and the Pacific (RAIF-AP), which I helped organize in November of last year. I wish to follow up with another analysis of the feedback from the organizers of the meeting this time. In total, at least 127 people have been involved at some stage or another in the organization of this regional meeting, with colleagues based in Europe, the Pacific and all countries in Asia. Among the collaborators, the majority were general service clerks who were involved in organizing the travel of the 115 participants. My immediate colleagues in the organization committee were fellow officers in the four host organizations: FAO, IFAD, the People's Government of Shaanxi Province (China) and UNIDO. We all reported to our respective Directors. The preparation of the technical programme started at least seven months before the meeting and there was a boost of activity in the two months leading to the forum in order to organize the travel of all funded participants. 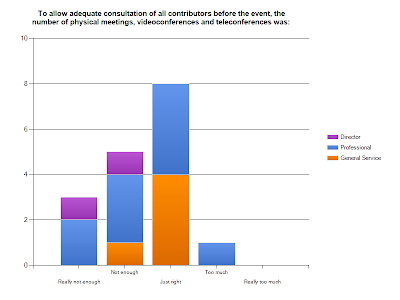 As coordinator of the organization committee, given the geographical spread of colleagues involved, and the relatively short timeline for preparations, I had chosen email as the main mode of communication for the preparations, with widespread cc of most officers involved to get their inputs; a few meetings and one teleconference was held. I wrote monthly reports to the Directors. After the event, I asked all colleagues involved to respond to a surveymonkey of organizers. I got 30 responses. Below is my analysis of the results, focusing on the main mode of communication chosen. 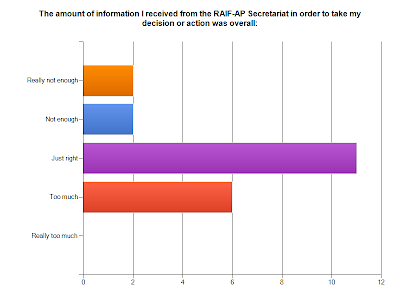 Overall, it seems like the majority of colleagues involved in the organization were satisfied with the amount of information circulated to allow them to take their decision or action. When cross-tabulating this response with the type of colleague, it appears that general service clerks and directors were satisfied by the amount of cc:. On the other hand, many officers who had received my lengthy reports thought there was too much cc:. One officer colleague even told me he had created a RAIF-AP folder in his mailbox where he automatically sent all emails that contained that acronym in their title. 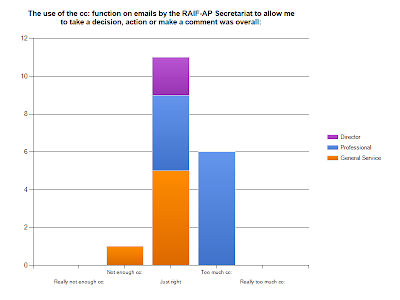 I was putting "RAIF-AP" at the beginning of all email titles so that interested colleagues could spot them more easily among all the other messages they got. It seems like not-so-interested colleagues prefered to file all the emails automatically rather than asking me to take them out of the mailing list. There was an equal share of contented and discontented colleagues on the choice of using email as opposed to meetings to handle the organization of the meeting. 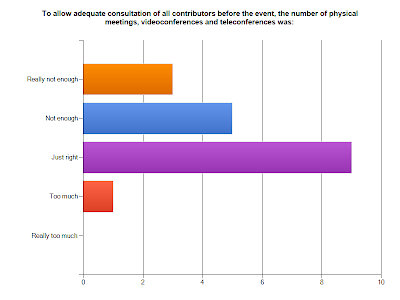 Nine respondents thought it was just right, but eight found that the number of meetings, videoconferences or teleconferences were really not enough or not enough. 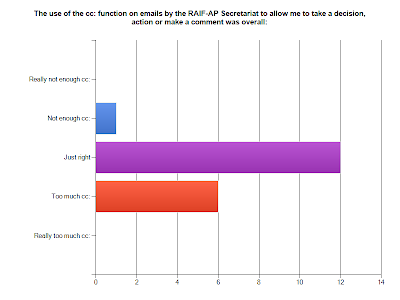 By cross-tabulating this response with the position of my colleagues, I found out that it was officers and directors who mainly felt that there could be more meetings, thus challenging the use of email as the main mode of communication and decision making. In a response to a separate question, I also found out that six colleagues who responded to the survey had felt sidelined at some point or another of the preparations. Overall, email seems to work fine to organize the logistics of travel for international meetings. On the other hand, when organizing a large event with peers, it seems that email is not always the best tool for communication and especially decision making among colleagues. From a previous experience with googledocs, which allow several people to edit a document simultaneously (for example, a draft technical programme), this tool requires strong active commitment from all colleagues involved or lots of very pushy reminders by the coordinator to request colleagues to visit the googledoc and make changes. By doing most of the work with my close colleagues and reporting to others for comments, I may have "passified" my colleagues who felt they could have played a more active role in the organization of the meeting, rather than reading reports of decisions that seemed to be already taken. So in future I will try out a regular fortnightly one-hour video- or teleconference with all involved who can show up, targeted to officer- and director-level colleagues. I hope this will give them as good a chance as email copies to be informed about the preparations for a meeting while giving them the impression of making a more active contribution to the organization through their oral feedback. All graphs produced by the analysis tool of Surveymonkey.